U.S. Senate candidates Mark Warner (D) and Ed Gillespie (R) were asked about a wide range of topics at Friday’s Battleground Virginia Forum at the Center for Innovative Technology near Dulles. Among the questions: the Affordable Care Act, balancing the budget, the Marketplace Fairness Act, Virginia’s economy and student loan debt. But the answers seemed to return to two themes: Gillespie pairing Warner with President Barack Obama and Warner pointing out his record of bipartisanship. 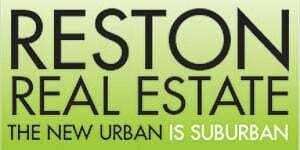 The event — sponsored by the Greater Reston Chamber of Commerce, along with chambers from Loudoun, Fredericksburg, and Prince William — was not a debate. The candidates appeared separately and were asked questions from a panel of chamber reps, as well as follow-ups from moderator Derek McGinty from WUSA 9 TV. 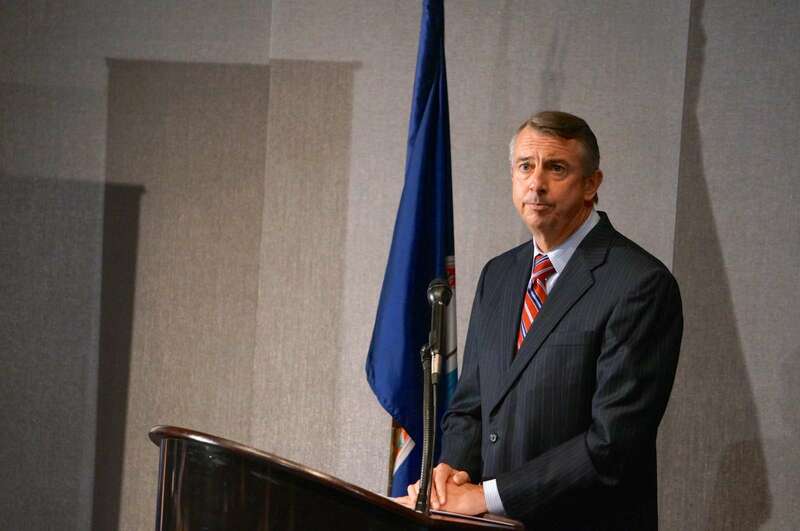 Gillespie, a former Republican National Committee chair, said Warner, first elected to the Senate in 2008, is not representing Virginia’s best interests. Warner pointed out that every piece of legislation he has worked on in the Senate has been alongside a Republican counterpart. He said Gillespie comes from a partisan world where it is always Republican vs. Democrats. 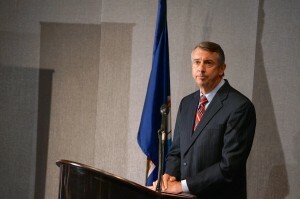 Gillespie repeatedly referred to his five-point plan, called EG2 (“Ed Gillespie’s Agenda for Economic Growth). His main points: Replace the Affordable Care Act, which he calls the single biggest drag on our economy; Unleash energy, starting with drilling off Virginia’s coast; Provide tax and regulatory relief; education reform and cutting wasteful spending and concentrate on beefing up defense. Warner says his career record speaks for itself. He referred to his term as Virginia governor (2002-2006), in which he inherited a deficit and left with a $1 billion surplus, a ranking as the best state in which to do business and the creation of 130,000 new jobs. 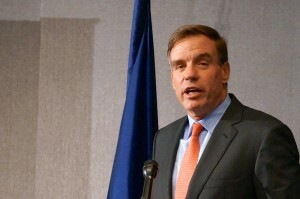 Warner cited across-the-aisle examples such as calling on the administration to stand up to Russian President Vladmir Putin and to build broader coalition against ISIL. Meanwhile, Warner called last year’s sequestration “stupidity on steroids,” even though he was among the 74 senators — a bipartisan mix — that voted in favor of it. He also said the ACA is flawed and the challenge is now to fix it, not repeal it. “What I hear constantly in Virginia is ‘we are tired of being a political football — just fix it’, ” he said. “They want to keep prexisting conditions, women treated equally as men, keeping kids on the plan till they are 26. But there is a lot Congress did not get right.